Thread: Singlespeed rear with 2 Rings Up Front? and please, if you have something ridiculous to say, just don't bother responding. Have a good one. Well, the only way it would work is if you had a front derailleur , and a chain tensioner. But im still not sure that would ever work. im a little tired, let me think about it. Take a look at the White Industries "Double/Double"
do a search on Paul Melvin Tensioner. Theoretically, if the two chainring sizes were close enough, you could run one gear at a time. Say you start with the chain on the outer chainring. To switch, you'd have to stop the bike, move the chain to the inner chainring, re-tension the chain, and ride in gear #2. If you have an EBB, you'd have to adjust it. If you have track ends, you'd have to move the wheel back to take up the chain slack. This might entail adjusting the V-brake pads or the disc calipers if the wheel moves enough. Sliders might create less of a pain. But like I said, in any case, the two chainrings would have to be very similar in size - maybe a one or two tooth difference to allow the same chain to be used. Hardly worth the hassle, since you'd only gain/lose a gear inch or two. Oh, and you'd have a screwed-up chainline 50% of the time. Instead of all this, just get an White Industries ENO hub and their double cog freewheel, run a single in front and two in the back. ENO takes care of chain tension. Last edited by FODM; 02-25-2007 at 07:44 PM. still run into issues with brake setup. I'm running a WI double-double with an ENO hub and it works pretty decently, although I rarely ride it in the "town" ratio. i've got other bikes that make better town bikes and some gear ratio/chainstay length combinations make for finicky tensioning of the hub eccentric which makes me not want to drop the rear wheel out to move the chain. related to the original question, the rear cog is 16/19 and i've successfully run both ratios with a single front chainring. the ENO hub will take up the three-tooth difference, depending on exact ratios, chain length and wear, etc. I got lucky and my brake pads were okay, but in all likelihood you'll probably have to mess with rear brake pads to change ratios. Its all in the dropout. Its all in the dropout. If your dropout is long enough you can do it. 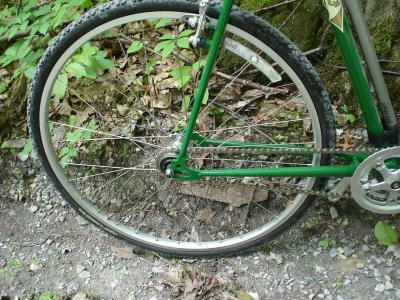 The Rivendell Quickbeam is a cross bike that does this. You can run an eight tooth difference between the rings, maybe more. Because of the angle of the dropout, the brakes stay aligned. I run my old Cannondale hardtail as a 3-speed. No dedicated single hub (sorry, after this post I'll go back to lurking ). I use a rear derailleur for chain tension with a front derailleur and 3 rings up front. With spacers on the freehub body I can line the chain up more evenly. I have often thought it would work much better as a simple 2-speed since the chain line issues crop up more severely trying to span 3 rings, but hey, it works. Mostly it sees duty as my fair weather urban commuter with slicks, but I did race a few laps on it at last year's 24 Hours in the Old Pueblo.